SKU: ZM50723. Categories: Sports & Recreation, Soccer. Tags: coaching, Jose Mourinho, Pep Guardiola, skills, skills of soccer, soccer. Soccer players are more than the sum of their parts: endurance, speed, shooting technique, passing technique, skills, and intelligence on the pitch. The soccer coach has to take all of these factors into one system that will create good players. 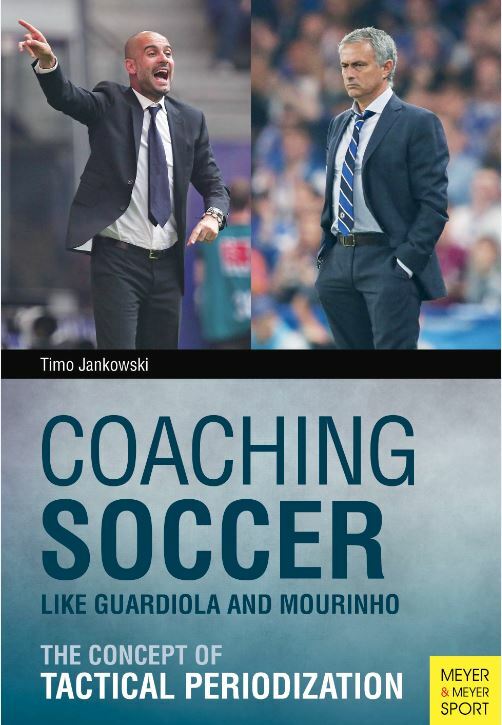 In Coaching Soccer Like Guardiola & Mourinho, you will receive direction in all of this. By creating match-like situations in practice, players learn to link their technical, tactical, and athletic abilities to match intelligence. They will learn to transfer their skills to soccer matches and they can improve endurance, technique, and tactics all at the same time while enjoying the practice sessions more. The author has evaluated and analyzed hundreds of training sessions and has tailored exercises to specific demands. All exercises are performed with a ball so that players learn to apply each skill to the game. Anyone coaching soccer players will find numerous exercises in this book to help them create better and more efficient practice sessions so they can improve their players and the team’s performance. With Tactical Periodization, your team will become better and be successful on the next match day! Timo Jankowski holds the UEFA A License and is Life Kinetic and Functional Fitness trainer. Following his jobs as coach of the German Football Association as well as of the U16 of Grasshoppers Zurich, Jankowski currently trains the U16 team of FC Aarau. In addition, he runs a sports center with a hotel and soccer school. He is the author of Successful German Soccer Tactics.